Sayville is excited to welcome Mike Wolfe, Frank Fritz and Antique Archeology to the area. The team will film episodes of their hit series American Pickers throughout New York. Filming will begin next month. Sayville, NY - March 11, 2015 - Sayville is excited to welcome Mike Wolfe, Frank Fritz and Antique Archeology to the area. The team will film episodes of their hit series American Pickers throughout New York. Filming will begin next month. 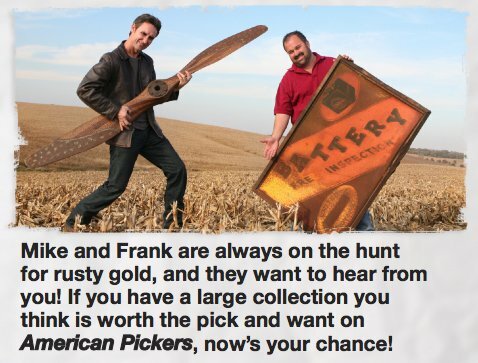 Subject: LongIsland.com - Your Name sent you Article details of "American Pickers to Film in Sayville"